Oh my! I know, this sounds big. It is, for me anyway and it’s Bulk Barn’s fault. They have those in their bulk bins and I can not resist them and are gone quickly once I bought them. Honestly, how genius is this anyway? 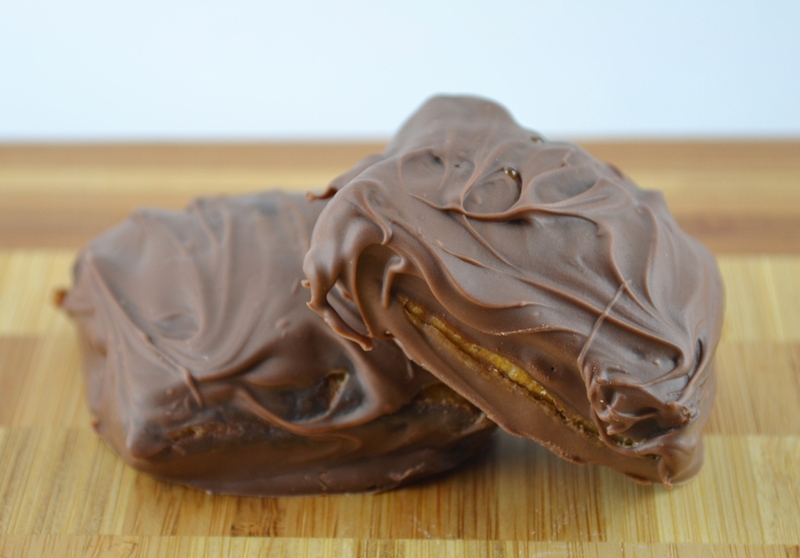 Chocolate, pretzels and peanut butter combine – that’s heaven. But how to make them at home? Is there a possibility? There has to be a recipe somewhere! I was looking for a recipe to make pretzel pockets online and this is the closest I got. I found this recipe at East Side Food Bites, who found the recipe at Two Peas and Their Pod, who adapted it from Bobby Flay. 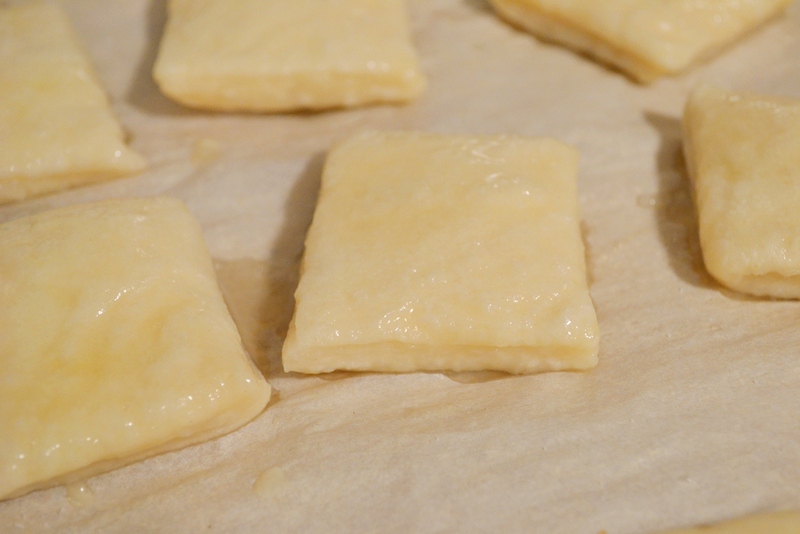 *phew* It seems no one really makes pretzel pockets, I guess it’s a bit too tedious to do. But you all know me too well, I do not shy away from difficult recipes. I will labour in the kitchen for 12 hours to make croissants from scratch, I shall make pretzel pockets filled with peanut butter and covered in chocolate from scratch as well. What the heck?! Why not! I noticed this difference the first time my husband corrected my pronunciation. He thought I was saying something wrong but I actually mean two different things. After reading a bit about it I noticed that our German word Bretzel was changed to the English pretzel. I guess I might be the only one who sees a different in the consistency, thus using two different names. Or I am just very different and confusing to my husband. The following recipes is a bretzel recipe, e.g. this is the soft version. Melt the butter, then add to luke warm water and mix in the sugar and yeast. Let this stand for 5 min or until bubbly. Combine the flour and salt in your mixing bowl and add the liquid to it. Use the hook attachment to knead the dough until smooth. It should not stick to the sides of the bow. If it is still sticky, add flour, if it is too dry, add some water. The dough should rest in a warm place until it has double, usually about an hour. Cover the bowl with plastic wrap and a tea towel. While you wait you can mix the water and baking soda and put on the oven. It should boil rather quickly so don’t turn it on too early. Line cookie sheets with parchment or grease them with oil. 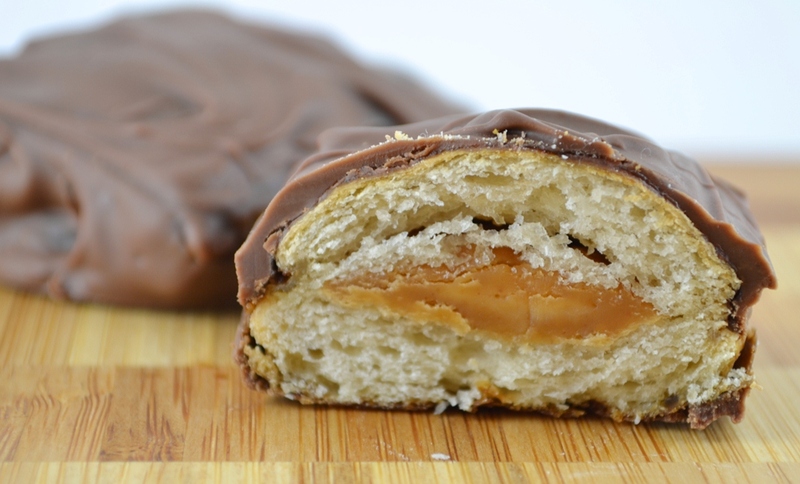 Peanut butter dollops on dough. Tip 1: It boils quicker when you cover the pot with a lid, however, when you uncover the boiling water is stops boiling and just simmer and you will need to turn on the heat more. I find that fairly annoying. Once the dough has risen, turn it onto a greased surface and give it a quick knead. 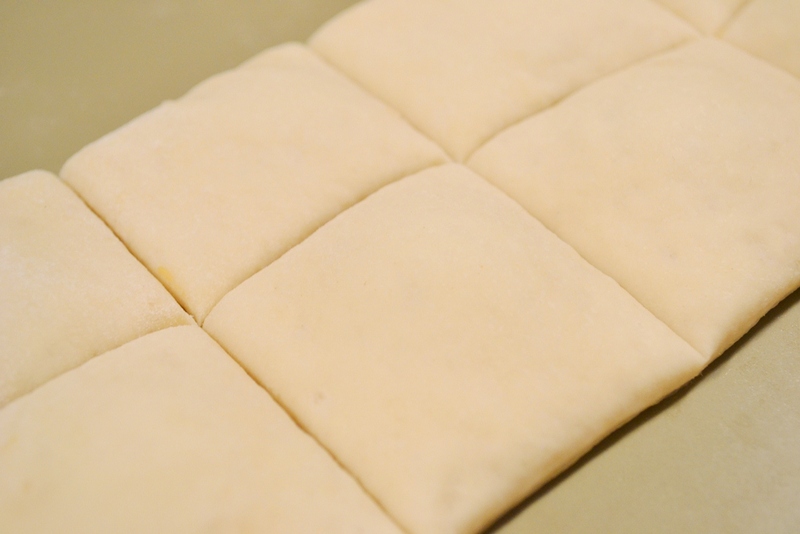 Then roll it out and make sure it’s thin. Cut in half. Use a small spoon and put dots of peanut butter on one half of the dough. Make sure you leave enough space so that you can cut the pieces. Cover with the second part and cut the pieces with a pizza cutter. 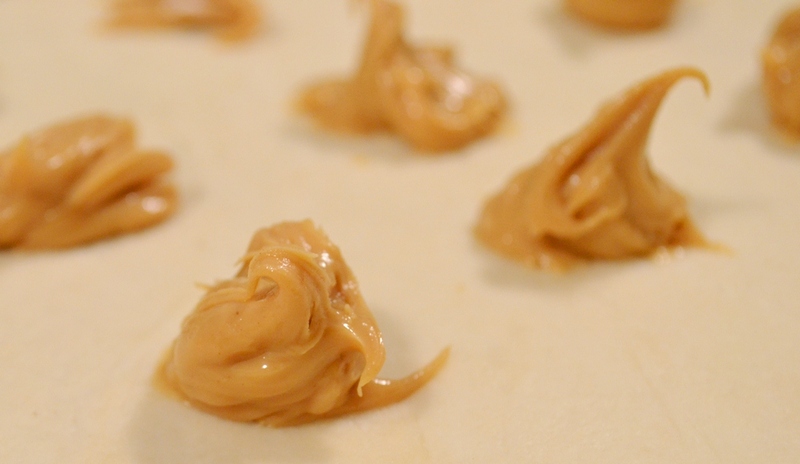 If your dough is too thick it will be tricky to see where your dollops of peanut butter are. Slightly press the edges together. Tip 2: I noticed that it is important that the water boils so that the dough puffs and cracks right while baking. Drop about 5 pieces into the boiling water and let them cook for 30 seconds. Make sure it is not longer, otherwise it will taste bitter. Use a spoon with holes to remove from the water and place on your cookie sheet, spacing adequately. Repeat until your cookie sheet is full. Brush with egg wash and sprinkle with salt. Bake a t 220°C for about 15 min or until golden brown and cracked. Make sure it bakes long enough so that the baking soda is gone, otherwise it will taste bitter. Remove from the oven and let cool down. Melt dark or semi-sweet chocolate and dip the pockets into the chocolate. Place on a wax paper to cool off and harden. Cooked and brushed with egg wash. 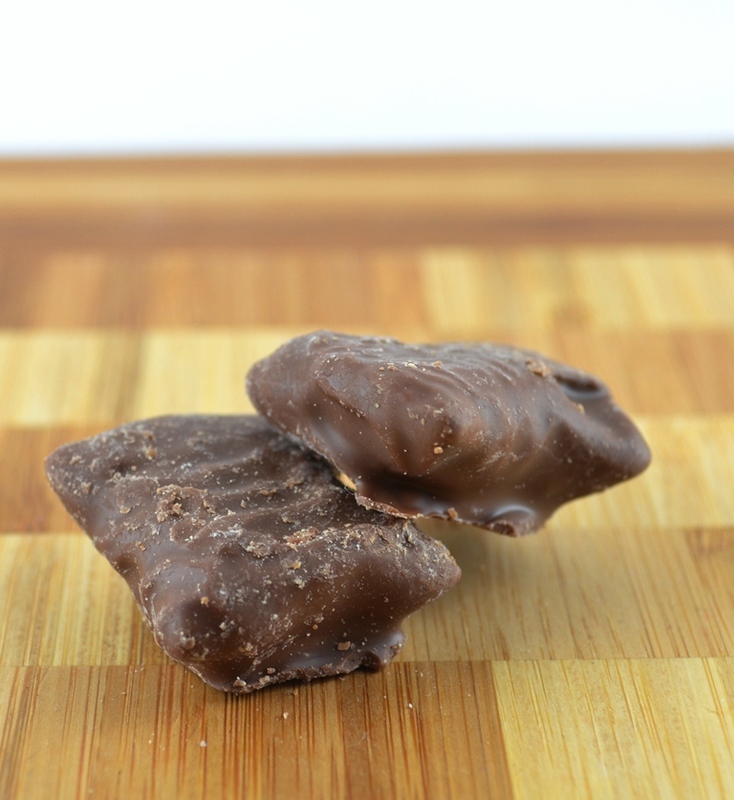 Tip 3: You can also eat them without being dipped in chocolate, it will taste also very good. Tip 4: Soft bretzels should be eaten as soon as possible or the consistency will get worse. It is still eatable but somewhat dry and gummy like. I also made regular bretzels, not just the pockets, and they were really nice as well. The recipes gives you a rather large amount of dough, so you can go crazy and do pockets, bretzels, bites and so on. Downside: I was not looking for a soft consistency but for a hard one. The Bulk Barn version is the pretzel version and I obviously would like to recreate that one. I found another recipes I will try soon and hopefully that is what I am looking for. Plus, they turned out pretty big in size, double the ones from Bulk Barn, if not more. 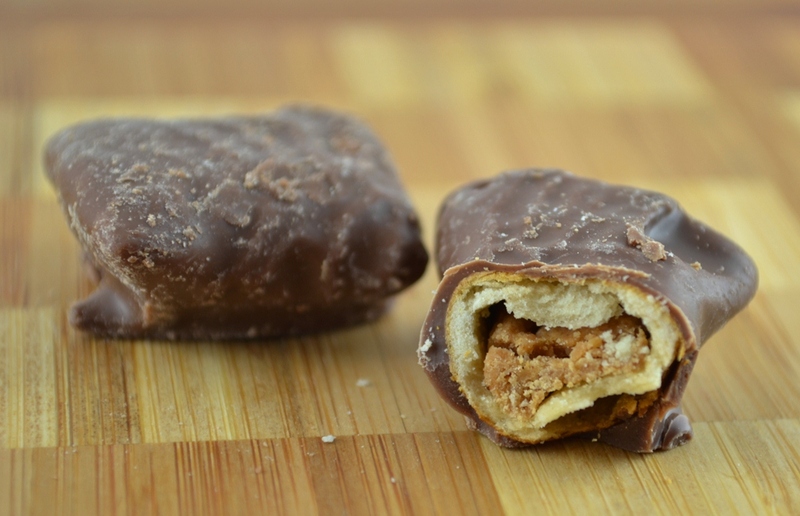 Chocolate Bretzel Pockets filled with Peanut Butter. Nevertheless, it is good to have such a recipe in my repertoire. As mentioned above, it is quite versatile and you can make various shapes with it. For example, make little bites for snacks for a BBQ or a Football game. Bretzels shapes are nice for the kids to take to school, or for a trip. You can make a Bretzel baguette and serve that for a pot luck. Just make sure it fits in the pot with the boil water/baking soda. Posted in Little Treats and tagged baking, bretzel, chocolate, peanut butter, pretzel, recipe, soft, treats. Bookmark the permalink.